Nearly every gardener knows that compost is good for the soil and provides slow-release nutrients to plants. But you don't need to amend your soil with compost to reap its benefits. By making compost tea, you can add liquid gold to your garden all summer long without the fuss of working it into the soil. Fill a large bucket with water. I prefer to use rainwater gathered in my rain barrel - but if you don't have a rain barrel using water from the hose is fine. Place the bucket in a sunny location where it will heat in the sun. This speeds the process as nutrients leach from the compost faster in warm water. It also prevents shock to the roots of your plants when you apply the compost tea. Make a bag from porous material, such as cheesecloth or the leg of old pantyhose. Fill the bag with aged compost. Secure the top of the bag with twine or garden ties. Keep in mind that as the compost becomes soggy its weight increases. Make sure the tie will withstand the weight of wet compost. Submerge the bag of compost in the bucket of water and allow it to steep for 24 hours. Lift the bag of compost out of the water and swish it up and down to agitate the water several times a day to agitate the water. This helps speed the process of releasing nutrients into the water. Remove the bag of compost. Add the compost to the top of your compost bin or mix it into the pile. Although you have leached the nutrients from the compost, the remaining organic matter will further decompose in your compost pile. Dilute the compost tea with water before using on your plants. I typically use a cup or two per gallon on water in a watering can and fill it with fresh water. Pour the compost tea around the base of plants or to container gardens once a week to provide a quick source of nutrients to promote healthy growth. Make enough compost tea for approximately one week to prevent issues with stagnant tea. 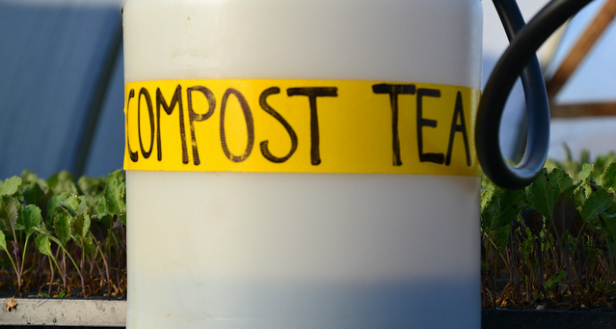 By making new tea each week, you will have fresh compost tea to feed your plants all summer.